Operating electric winches and off-road lights creates tremendous loads on the Toyota's electrical system. Toyota's factory rated 40 & 45 amp alternators cannot keep the battery in a stable condition when winching or operating other accessories for extended periods of time. Our new series of heavy-duty, Nippondenso high output alternators allow you the security of maximum current availability when operating your truck in remote areas, without the fear of a dead battery. 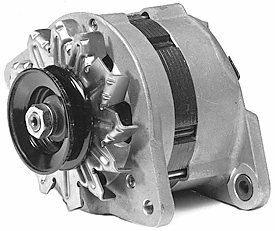 These high output alternators will bring your truck's battery to a fully charged condition twice as fast as the stock alternator. 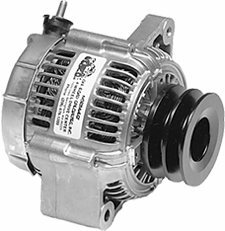 Both of these heavy-duty small case alternators feature special, high output stator assemblies and special triple diode assemblies. They are epoxy sealed to ensure unit integrity against dust and vibration. The diameter of the custom pulley increases low rpm output. The 90-110 AMP series alternators are a direct replacement and utilize Toyota's original wiring harness and factory mounting hardware. 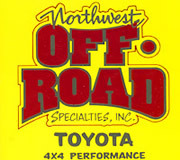 Due to several changes by Toyota please include when ordering: the original equipment tag number from your truck's alternator and regulator, and whether there is an IC regulator on the driver's side fender. 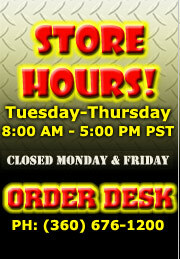 The 130 and 160 AMP alternators are internally regulated and will handle huge lighting, winching, or stereo AMP loads. *130-160+ units may require minor modifications to install. SWEETNESS OF LOW PRICES IS FORGOTTEN"
Design & Hosting by Duane Elliott Ent.